the skin, often creating pain, redness, swelling, and warmth in the toe. If an ingrown nail causes a break in the skin, bacteria may enter and cause an infection in the area, which is often marked by drainage and a foul odor. However, even if your toe isn’t painful, red, swollen, or warm, a nail that curves downward into the skin can progress to an infection. you are at greater risk for developing an ingrown toenail. If you don’t have an infection or any of the above conditions, you can soak your foot in room-temperature water (add Epsom’s salt if you wish), and gently massage the side of the nail fold to help reduce the inflammation. Avoid attempting “bathroom surgery.” Repeated cutting of the nail can cause the condition to worsen over time. If your symptoms fail to improve, it’s time to see a foot and ankle surgeon. Permanent removal. Various techniques may be used to destroy or remove the nail root. This treatment prevents the recurrence of an ingrown toenail.Your surgeon will determine the most appropriate procedure for you. Following nail surgery, a light bandage will be applied. Most people experience very little pain after surgery and may resume normal activity the next day. If your surgeon has prescribed an oral antibiotic, be sure to take all the medication, even if your symptoms have improved. 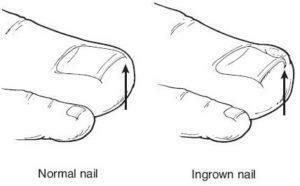 Trim your nails properly. Cut your toenails in a fairly straight line, and don’t cut them too short. You should be able to get your fingernail under the sides and end of the nail. are loose, because they too cause pressure on the toes, especially when you run or walk briskly.